Flies a continuing problem for your horses and pets? Try UltraShield EX Insecticide & Repellent. Ultrashields Most Advanced Protection. Lochte Feed and General Store carries a large selection of equine products to meet your needs. Animal health, feed and supplies are all in stock at our location in Fredericksburg, TX. 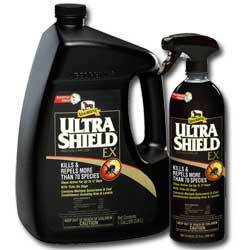 Keep the flies off this summer with UltraShield fly sprays. We carry the full line. This entry was posted on Tuesday, May 10th, 2016 at 2:59 pm	and is filed under News & Updates. You can follow any responses to this entry through the RSS 2.0 feed. Both comments and pings are currently closed.